Why are VATs and sales taxes so unpopular? One common critique is that they are regressive. ... But if you measure a VAT or sales tax relative to total spending by individuals—the rich generally spend a lot more than the poor—those taxes actually look progressive. The argument that higher value-added taxes is a great solution to income inequality, because it can fund cash transfers to the less fortunate, is hardly new to me. However, it is the first time I read that VATs may naturally be progressive, even without any cash transfer to the poor. Is there any literature backing his claim? A 'progressive' tax does not mean that the rich pay more than the poor. A 'progressive' tax means that the rich pay proportionately more than the poor. A 'regressive' tax is one where the rich pay proportionately less than the poor. Value added taxes are generally considered regressive. 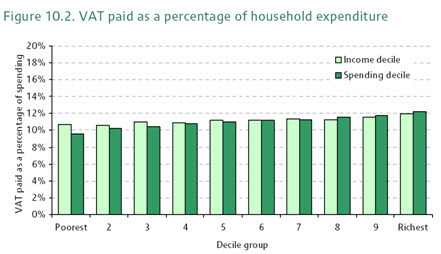 The message from this data is unambiguous: the poorest 20% of households in the UK have both the highest overall tax burden of any quintile and the highest VAT burden. That VAT burden at 12.1% of their income is more than double that paid by the top quintile, where the VAT burden is 5.9% of income. VAT is, therefore, regressive. However many countries make adjustments to make them more progressive, such as the UK which exempts basic necessities like food. With those adjustments VAT may be considered progressive according to a study examining the UK version specifically. Or it may not. Flat rate sales taxes with no exemptions are more likely to be regressive. The very wealthy tend not to spend all that much of their money on things that are typically subject to consumption tax. According to Forbes (in 2006; much clicking needed to find the data), the only category where Americans with incomes in the top 20% vastly outspend those in the bottom 20% (fractionally) is in insurance and pensions, neither of which is normally taxed. (Forbes doesn't mention investment, but this also follows similar trends.) Even if you avoid taxing food, this really shifts the relative burden not "progressively" more to higher income earners, but centrally to middle-income earners. VATs and sales taxes tend to be more efficient and harder to avoid than income taxes. VAT is sales tax. It is not an income tax. Thus subject to taxation are personal and corporate expenditures. And as far as expenditure goes, VAT is in clearly and evidently progressive (dark green columns on figure below). Now, the argument is that poor spend more than they earn, while rich make savings, thus the first spend higher percentage of their income on VAT. There are however two flaws with this argument. First, it is typical apples to oranges argument. VAT is sales tax, not income tax, so it makes absolute no sense at all to calculate VAT as percentage of income. Second, as you can clearly see, even if you just look at income (light green on the figure), it's still progressive. Ironically, these facts don't prevent author of the referenced article from arguing, that VAT is regressive. Not the answer you're looking for? Browse other questions tagged economics taxes .